Today is the last official day of my spring break. Sigh, but I am really glad to have today to get ready for the coming week instead of having to teach today. And since I did not accomplish as much work as I had hoped, I really need the extra day. So what did I do over spring break? I made a hat. 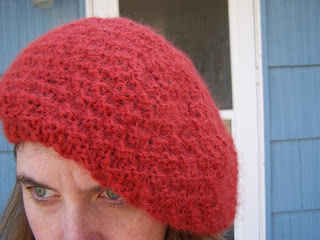 Le Slouch - a nice orange floppy beret. I have been wanting to have a floppy beret for a long time. Needless to say, I have been wearing it all week. 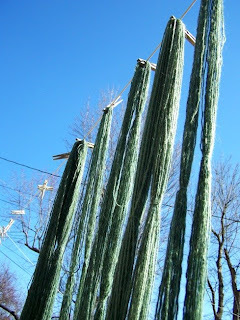 became In order to become the Aleita Shell from the Spring 2008 Interweave Knits. I am close to being done with the new vest and hope to have pictures soon. 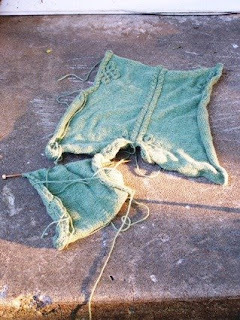 I wasn't happy with how I knitted the cable on the first vest, and I really, really like the Aleita Shell. Reading - I did a lot of reading this weekend - while knitting, through basketball games, until late at night. The books I read over the break are highlighted with an asterisks over in my book list. I really love reading. Building - A really crude compost pile, from fallen branches and an extra gate we had in our garage. 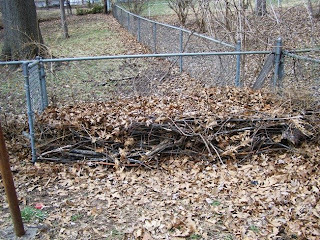 Once this was finished, we were able to rake up most of the leaves in the yard. Enjoyed the weather - we had a couple of fantastic days weatherwise in KC. We took one afternoon and visited Burr Oaks Conservation Area. I will post a photojournal of that hike soon. Other fun spring break activities - Dinner with friends, party last Sunday celebrating the fact that there was no school on Monday, watching the NCAA basketball tourny (my bracket is a mess after the first two rounds), eating ice-cream, and playing with the cat.